I was on my way to Congressional, a country club founded by five US Presidents. The invitation was to attend a wedding, not play eighteen, but that wouldn’t stop me from taking a look at the golf course. 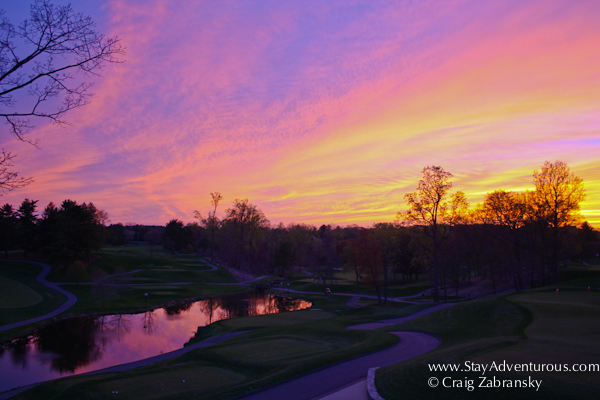 I decided to walk a few holes of the course and then with the cocktail hour finishing as the day departed, I made sure I captured a special sunset at the black tie affair. It’s not often I photograph anything with my tuxedo on, but this sunset required notice and appreciation. Just night before I watched a sunset from Gettysburg National Military Park and then I watched one at Congressional Country Club. I sipped my cocktail from the veranda and wondered who else throughout history also watched sunsets from these iconic American landscapes. Presidents? Generals? –Yes, I am sure they did, but also people just like you and me watched them too. We all paused to appreciate the beauty in the sky and enjoyed a moment. The sunset is something everyone can appreciate from anywhere and that is why I love it so. Happy Sunset Sunday. I don’t see you in your tuxedo here. The sky and lighting are perfect. One of my favs, plus the one you use for your Twitter banner. Thanks Mary… and no, but I was in a tux, definitely one of my better sunset captures with a bowtie on… (for a glance, check out my @StayLuxurious twitter handle image… It may make the calendar, depending on my theme for 2015. But I agree, it was a winner. Beautiful Sunset colors. You seem to find great Sunset wherever you go. How was the golf course?